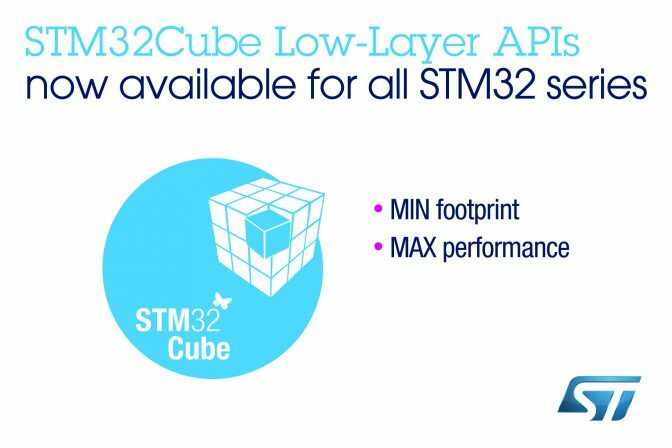 STMicroelectronics has completed the introduction of its free Low-Layer Application Programming Interface (LL API) software to the STM32Cube software packages for all STM32 microcontrollers (MCUs). The LL APIs enable expert developers to work within the convenient and easy-to-use STMCube environment and optimize their code down to the register level using ST-validated software for faster time to market. The combination of LL APIs and Hardware Abstraction Layer (HAL) software in all STM32Cube packages now gives developers complete flexibility when choosing how to control device peripherals. They can leverage the HAL’s ease of use and portability or use LL APIs to optimize performance, code footprint, and power consumption. Code examples tailored to run on the associated STM32 Nucleo board provide templates that simplify porting to other STM32 MCUs. With features such as peripheral-initialization services that are functionally equivalent to STM32 Standard Peripheral Libraries (SPLs), the LL APIs presents an easy migration path from the older SPLs to the simple but powerful STM32Cube ecosystem. Using the LL APIs can deliver superior performance, comparable to that of STM32Snippets direct-register-access code examples. The LL APIs are MISRA-C 2004 compliant except where indicated and have been checked using Grammatech CodeSonar for optimum code quality and reliability. An automatic update mechanism inside STM32CubeMX keeps the LL APIs up to date with the latest releases. As a further boost to productivity, the STM32CubeMX tool automates the generation of peripheral initialization code with LL APIs for STM32L0, STM32F0, STM32L4, and STM32F3 MCUs. Support for the remaining STM32 series will be added in the coming months. A written guide and an automated tool for the SPL-to-LL code migration are also available.